Hey loves welcome back. If you're a frequent reader/visitor here, you know that I am obsessed with pointy toe heels. They compliment just about any outfit and instantly add a touch of sophistication to your look. In the summer, I was applying for a Master Degree program in Fashion Marketing. While brainstorming for my personal statement, I did some reflection and realized that I have some type of sentimental attachment to pointy toe heels. When my mom passed away, my dad kept a suitcase of some of our baby gear. Five or six years later, I was either 10 or 11 years old when he decided to open the suitcase and let us go through it. While we were going through it, I found a pair of my mom's shoes which was surprising because we were told that my dad sold all of my mom's jewelry and gave all of her clothing and fashion items away to his many girlfriends. How gross?!!! I will never forget what they looked like. They were pointy toe, made out of this velvet type of material. The main color was black but it featured this emerald green color towards the back and this gold ruffle detail. The heels were not too high, about two and half to three inches tall. I instantly tried them on but they did not fit because they were a size 6 and at 11 years old, I already wore a size 7. I was so disappointed!!! Fast forward four or five years later, we moved back to NY to go to school. My sister and I were allowed to buy our own clothes for school and I bought a bunch of pointy toe heels for High School. I had them in different colors. I would even wear them even when it snowed with socks (foolishness!). Fast forward 10 years later, I now have a growing collection of pointy toe heels. I always find myself gravitating towards them more than my other shoes. 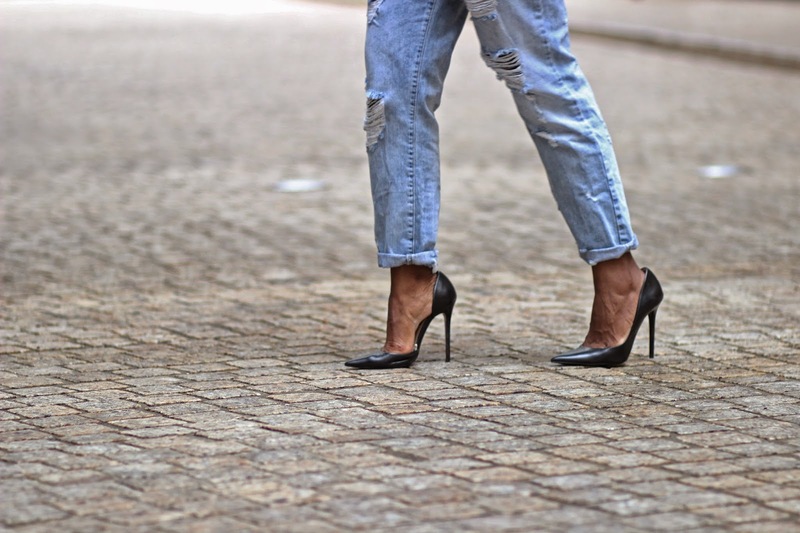 On the high street, I usually find my favorite pairs from Zara (SHOP HERE). Aldo usually have a nice selection as well. I find that black pointy toe heels are very hard to find on the high street. As for high end, you know Christian Louboutin is killing the game right now (SHOP HERE). YSL, Gianvito Rossi and Jimmy Choo have a nice selection of pointy to heels as well. You know how businesses get when they see their competitors doing well with a certain product - they make a dupe of it. Now the choice is yours. Hope you all enjoyed this text heavy post. Would love to hear your stories! Do you have some type of sentimental attachment to anything? Leave a comment below.